Be prepared...this isn't going to be Paleo. But since this is a food blog, and as a paleo follower I do allow cheat days, this is a perfect place to highlight food from my travels. So, here are the reviews of the places I visited in SLC. And if you happen to have a heck of alot more will power than I do and you follow a strict paleo diet, all of the places I chose did have strictly paleo items that you could have eaten. I just didn't. No willpower when I travel, remember? First up, The SweetTooth Fairy. 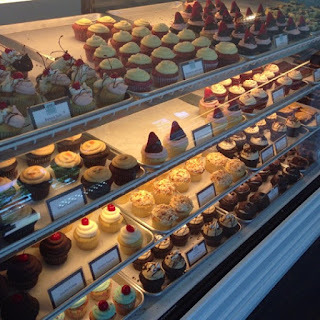 (Multiple locations) BEST CUPCAKES EVER. I have been to Magnolia and Sprinkles and they don't even compare. The VaNIElla is by far my favorite. Moist but not overly dense cake with the perfect amount of almond butter cream frosting. Second best is Toasted Coconut. Almost as good as Barefoot Contessa's was, and that is saying something. Red Iguana. (Downtown SLC) Fodor's calls this one of the best Mexican restaurants in the US and I can see why. I met my friend Jami there for lunch and I am glad we went early. If you arrive anytime after 12:00 be prepared to wait. I started with Hongas Al Ajillo, which were mushrooms marinated in garlic, butter, wine and crushed red pepper. Out of this world delicious. The whole button mushrooms were perfectly cooked with the right amount of garlic and chile. The flavors enhanced what is usually a bland tasting mushroom. My main dish was Puntas de Filete a la Nortena. OH MY WORD. 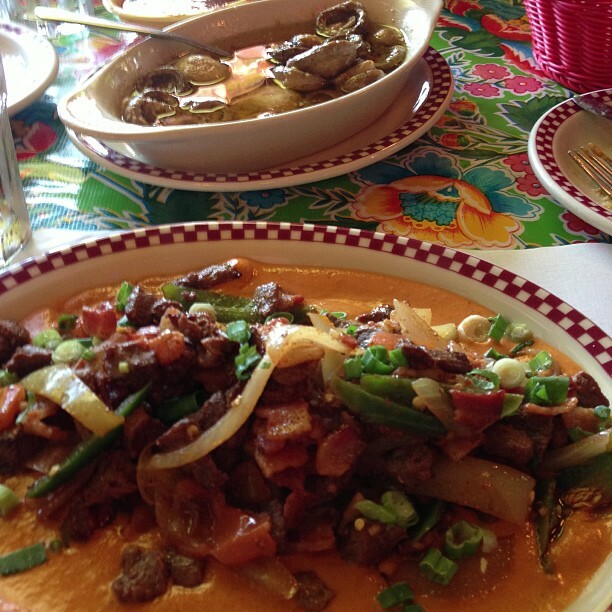 Steak, bacon, jalapeño, onion and tomatoes with an almond mole. Perfectly cooked steak cubes and bacon were complimented by spicy jalapeno and cooling tomatoes enveloped with a creamy almond mole, which wasn't too spicy and was smooth. Foodgasmic. At least this meal was Paleo! Communal. 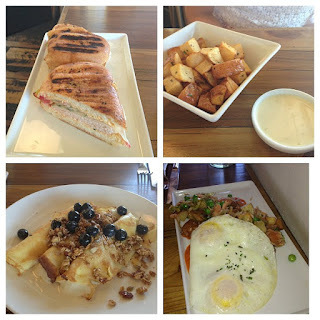 (Provo) The last time I went to lunch with my dear friend Laurie we went to Pizzeria 712, one of their other restaurants, so I was excited to try this farm to table , local and sustainable place. I wasn't disappointed in anything except that I didn't get to have dinner there too. We met after she got done running a half marathon (next time I'll run with you Laurie!) and they were serving brunch. So of course we had to order a few items to try. First we had lemon-grapefruit crepes with a granola/blueberry topping. The ricotta filling was done right. Smooth with a perfect blend of the lemon-grapefruit seasoning. The crepes were thin and the ricotta was consistent enough to stay in the crepe without being overly runny or heavy. The house made granola wasn't overly sweet and the accenting blueberries were plump and juicy. Next up the Summer Vegetable Hash with Smoked Salmon and Eggs. They smoke their salmon in house and it was sublime. Melt in your mouth salmon with a very light, but distinct smoke and salt. I would go back just for a slab of this smoked salmon. Really. The Cuban Panini with House Fries and a Bleu Cheese dipping sauce was our last dish. How can you go wrong with a Cuban? Turkey, cheese, pickle, and mustard on bread and pressed. Definitely one of the better ones I have had. And the bleu cheese sauce that accompanied the fries was just the right amount of bleu cheese, although a tad too runny. Sakana Sushi Bar. (West Jordan) I love that I can take credit for turning my nieces and nephews onto sushi as this is the place I took them to eat the last time I was here. Emily opted to dine here for bachelorette party and I was more than happy to break my Paleo diet (as if I hadn't already at this point) to enjoy some sushi. They start by bringing freshly steamed and salted edamame to the table. We started with some Vegetable Tempura. They know how to do it, flour with soda water. Perfect combination for a crispy exterior and soft interior. I choose the G2 and Hotty Rolls based on the waitresses recommendation. The G2 was yellowtail and cucumber topped with white tuna, avocado, garlic, ponzu sauce (citrus based) and green onion. Very mild and light flavors of the fish shined with the ponzu sauce accent, which fortunately wasn't too overwhelming. 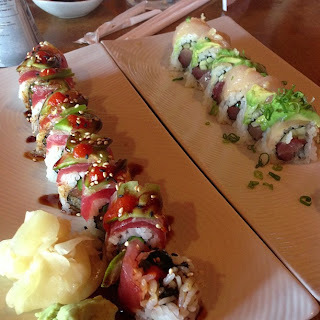 The Hotty Roll is something I have never seen on a sushi menu and incorporated a hint of flavors from Mexico. Salmon, avocado and asparagus were topped with tuna, jalapeño, lime, eel sauce, hot sauce, and sesame seeds. The sauces were a great mix of sweet and spicy that served to temper the spicy bite of the jalapeño and enhance the mild tuna. Once you enjoyed that layer, your taste buds were played in a different direction with the sweeter salmon, creamy avocado and crisp asparagus. You really couldn't go wrong with this roll. 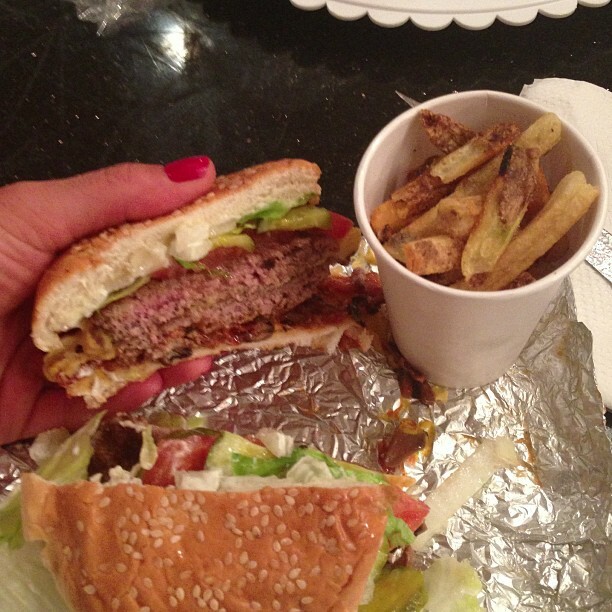 Five Guys Burgers and Fries. (Multiple Locations) I was a little worried about trying this place because the last time I was here people kept telling me I had to go try In and Out because it was SO good. Well, I was severely disappointed. But it was late after the reception and I had already consumed way too much sugar so I decided salt should offset it, right? I'm glad I did. As far as fast food burgers go, Five Guys is legit. My bacon cheeseburger (might as well go for the gusto, right?) was cooked perfectly medium rare (they way beef SHOULD be). I loved the many options to top on the burger and they they were all, with the exception of the mushroom, fresh. (Come on Guys, saute those babies!) There website of course says they cook their burgers well done (just puked in my mouth) but I was pleasantly surprised to see this when I cut mine! My BIL tells me I missed the whole experience because I didn't get Cajun fries. Do you want to munch on some tasty recipes as soon as TONIGHT?